Pleasantly Disputing for Place and Precedence, The Brewers-Cart being Moderator. A small book by Henry Peacham written in 1636 and detailing an argument had between two forerunners of the London cabby on the streets of London. What is handy is that the text agrees with the pictures, dating the image securely and there is a description of what the two are wearing. The One (the lesser of the two was in a suite of greene, after a strange manner, winnowed before and behind with Isen-glasse, having two handsome fellows in greene coats attending him; their lace coats were lac’d down the back with a greene lace suitable, so were their half sleeves which persuaded me at first they were some cast suites of their Masters; their backs were harnessed with leather cingles, cut out of a hide so broad as Dutch-collops of Bacon, whereat I wondered not a little, being but newly come out of the Countrie, and not having seen the like before. The odd thing about this description is that id doesn’t really tie in with the picture. However, if you look at this as a satyrical piece, you realise that the character “Coach” is actually the coach rather than the coachman! The other was a thick burly square set fellow, in a doublet of Black-leather, Brasse-button’d down the brest, Backe, Sleeves, and winges, with monstrous wide boots, fringed at the top with a net fringe, and a round breech (after the old fashion) guilder, and on his back-side an Atcheivement of Sundry Coats in their proper colours, quartered with Crest, Helme and Mantle, besides here and there, on the sides a single Escutchion or crest, with some Emblematicall word or other; I supposed they were made of some Pendants, or Banners that had been stollen, from over some Monument, where they had long hung in a Church. Here’s the carter in his leather doublet (note brass buttons in the text) and his livery coat over the top. 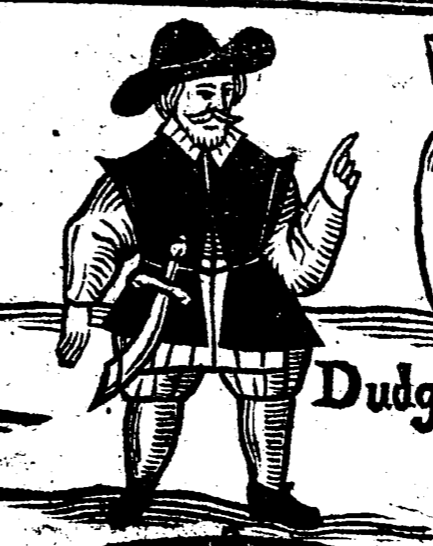 Strangely no boots, though the woodcut seems correct in all the other departments. Or the errours of the people in physick, first written in Latine by the learned physitian James Primrose Doctor in Physick. 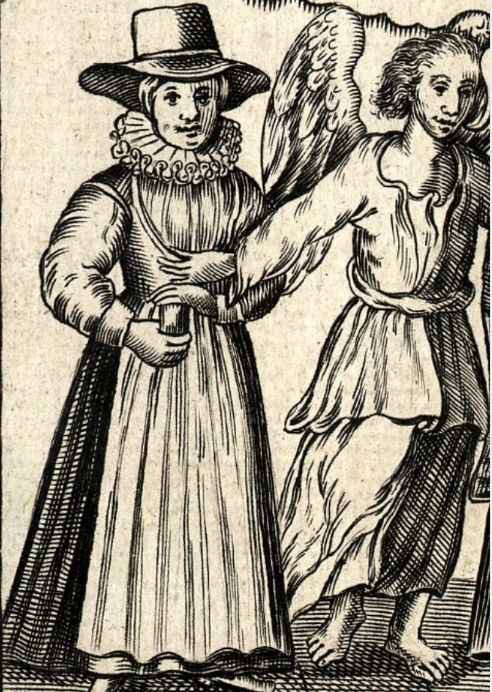 The Latin version was published in 1638, but the English translation came out in 1651 and featured this image. It was a defence of the arts of the learned physician against quack and untrained doctors written in an entertaining style, presumably so that he could reach the largest audience possible. The picture shows a poor fellow in his sick bed, being ministered to by a doctor, but also a well meaning goodwife who is trying to help but is being restrained by an angel of mercy. She is wearing a petticoat, waistcoat, long apron, ruff collar and a wide brimmed hat over a linen coif. The doctor in a gown, cap and ruff and the ill fellow in his shirt and night cap. To see the sicke, and brings her remedie. It lies sore in your bones, no part is free. His nose is sharpe, his nostrills wide, he’le die. Then all Hippocrates, or Galens Art. Approves his Art, and what he doth must stand. To cure diseases, leave then all the rest. At Tower Hill, June 8th 1658. Etching from the time. Hewitt and Slingsby were caught up in the machinations of politics at the time and were plotting for the restoration of the monarchy. Hewitt was well known for his preaching and had been chaplain to the Royalist Earl of Lindsay as well as marrying his sister. Slingsby had fought with distinction in the war and the shirt he wore on the day pictured below is available to view in Knaresborough Castle Museum (don’t miss the tunnel tour if you go). Sadly for the good Doctor and Sir Henry, they don’t seem to have pulled much of a crowd, though Dr Hewitt’s speech and the account of his trial were both popular publications in the days that followed. 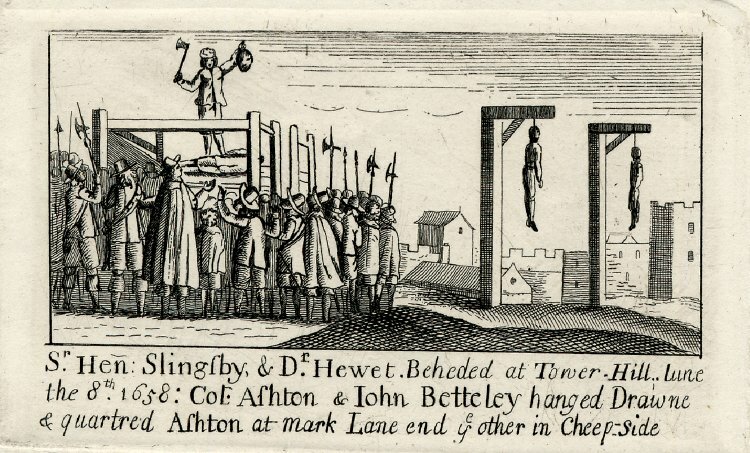 The executioner is wearing a coat and breeches and some kind of cap and the soldiers and the three or four onlookers surrounding the scaffold are dressed similarly though with brimmed hats and the odd cloak. 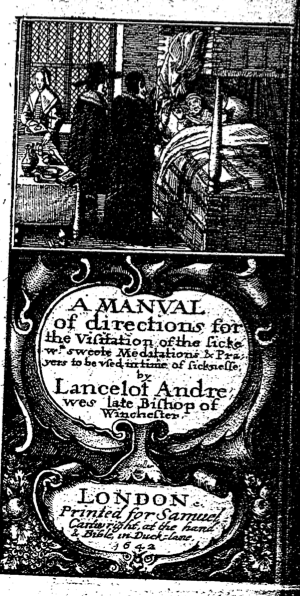 It must have been a cold June in 1658.
for the Visitation of the Sick with sweet Meditations & Prayers to be used in time of sickness by Lancelot Andrewes late Bishop of Winchester. 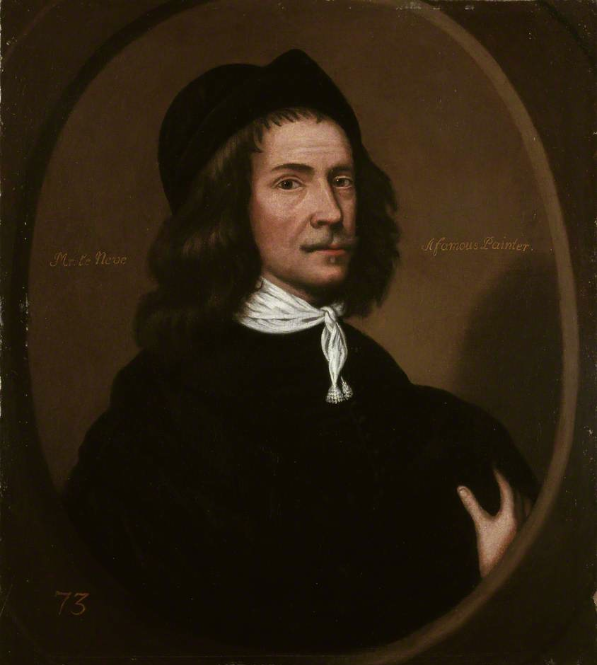 Andrewes was one of the more moderate independant clergy and had some influence on the young Charles, though he was dead long before war broke out. 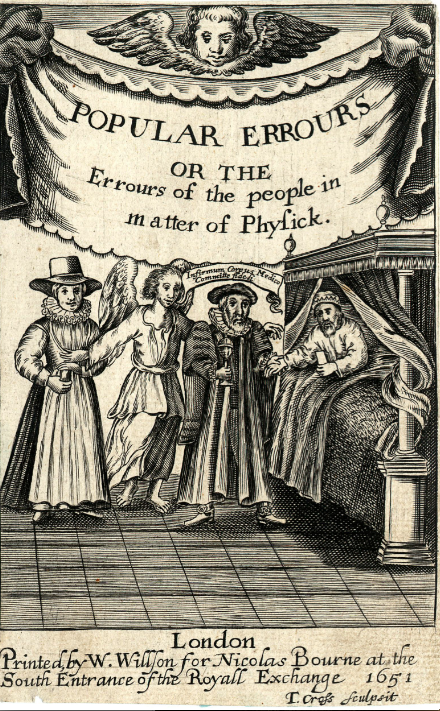 In the frontispiece by Hollar from the 1642 edition, we see two professional gents (either could be doctor or priest) visiting a poor soul in his sickbed with a serving girl busying herself behind a table. Looking at the picture in more detail we can see the woman on the left is dressed in a laced bodice, over which she wears a neckerchief and linen coif on her head. The two gents are dressed professionally, on the left in a cloak, ruff and wide brimmed hat and on the right in a gown and day cap. It’s almost impossible to decide which is doctor and which is clergy as both professions would have worn either garb, though maybe the vicar is the one on the right with his hand raised in blessing. The patient has a fringed night cap on his head and presumably a shirt, though the detail is a bit scratchy when you look closely. 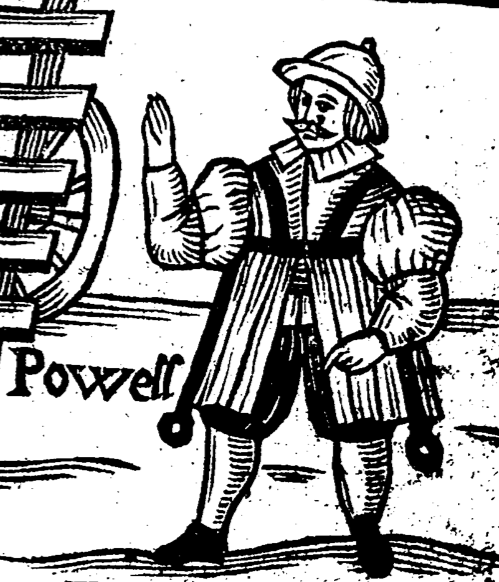 It does look however that he’s thrown his doublet over the top of his bed. Nice collection of living history objects on the table. 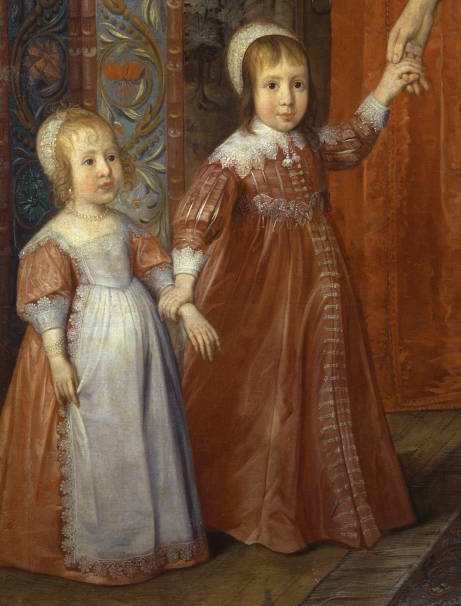 Thought to have been painted by David des Granges in 1636 or 37, this picture hangs in the Tate Gallery. In fact it’s worth checking out the gallery’s webpage on the history and symbolism of this picture. 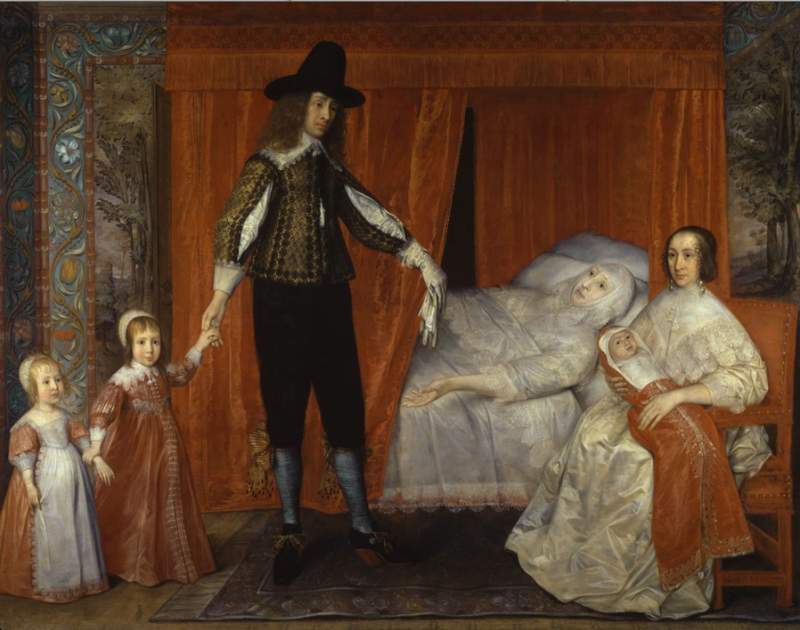 The picture is thought to show Sir Richard Saltonstall and his family. The wan figure in the bed is probably his dead wife Elizabeth. This is a picture of a well-to-do family dressed in their best clothes, designed to impress. Sir Richard wears a short textured silk doublet with what looks like embroidery along the seams. The sleeves are slashed revealing a high quality shirt and his cuffs and band are stylishly laced. His breeches are fashionably tight and the ties at the lower end match his doublet. Heeled shoes, high crowned hat and some light gloves finish off the collection. The two women, thought to be his two wives are dressed in white. 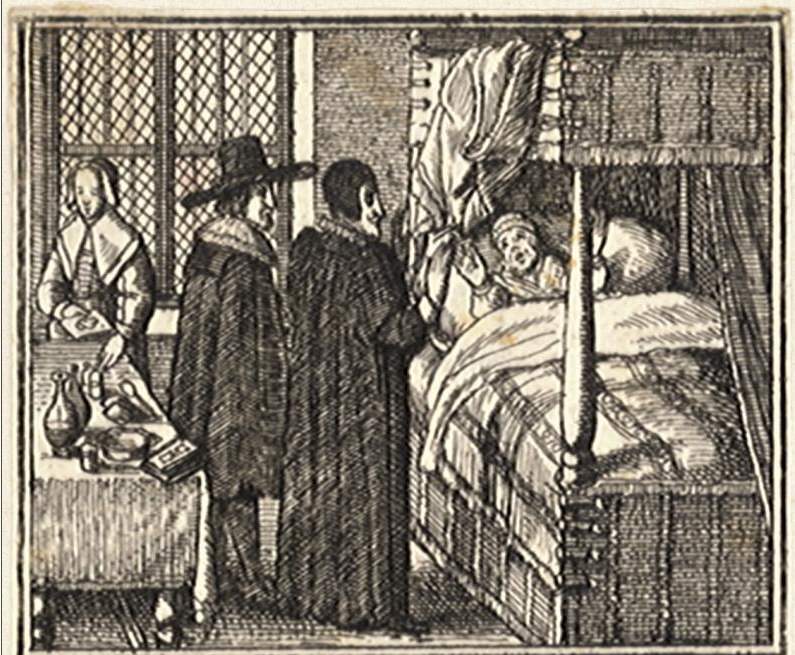 The lady on the bed in what looks like a smock with lace insertions, a very high status item, with a laced hood possibly around her head. The seated woman in a satin dress and layered, laced kerchief. 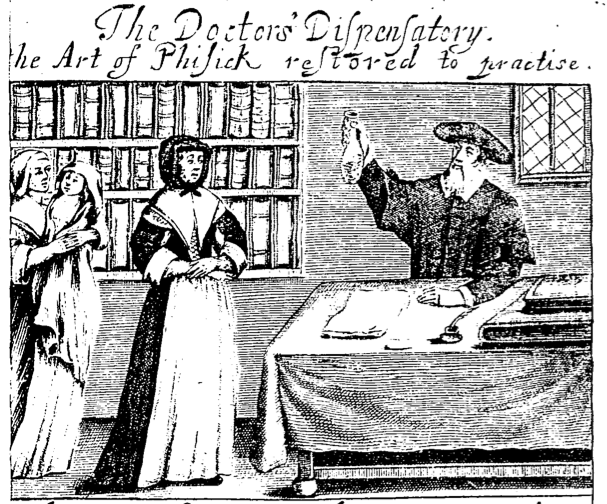 The whole Art of Physick restored to practice and The Apothecary’s Shop Opened. 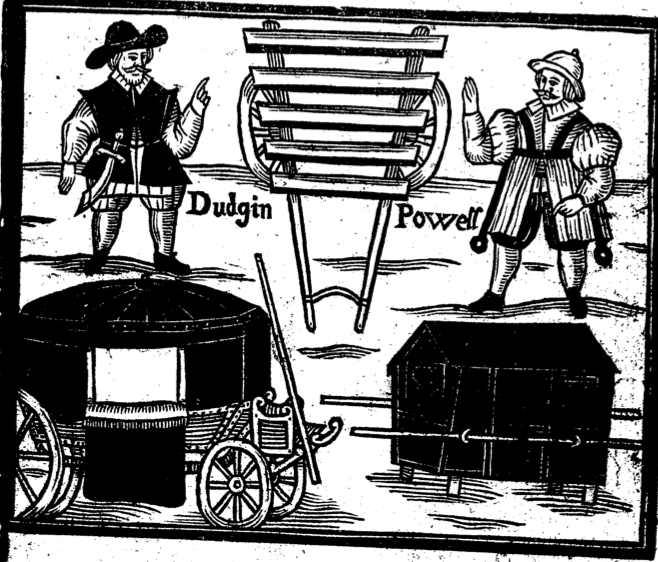 London 1657. A bit late for the 1640s I admit, but there is a nice illustration on the front cover of this book, one of those ones that you read and by the time you get to the end, you imagine you’ve got most of the ailments described within. Here’s the doctor and two ladies who have brought him a sample for examination. M’lady looks a tad worried. Perhaps a course of leeches? The doctor is in his professional clothes, a gown to prove he went to university and what looks like a canterbury cap which presumably also indicates his training for this sort of thing. The lady is smartly dressed in bodice and petticoat with a sharp neckerchief, apron and chaperone hood. 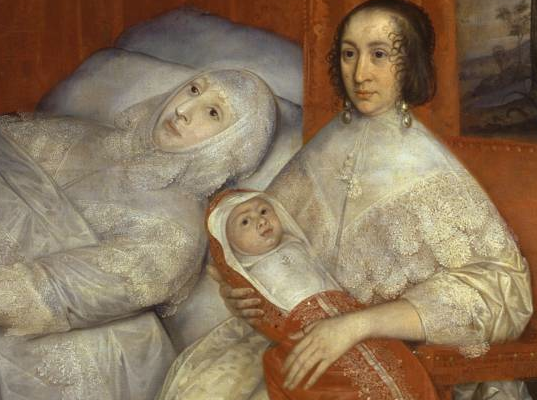 The goodwife behind is in slightly lower class garb, (what we can see), with a linen coif on her head, the baby wrapped in a blanket. 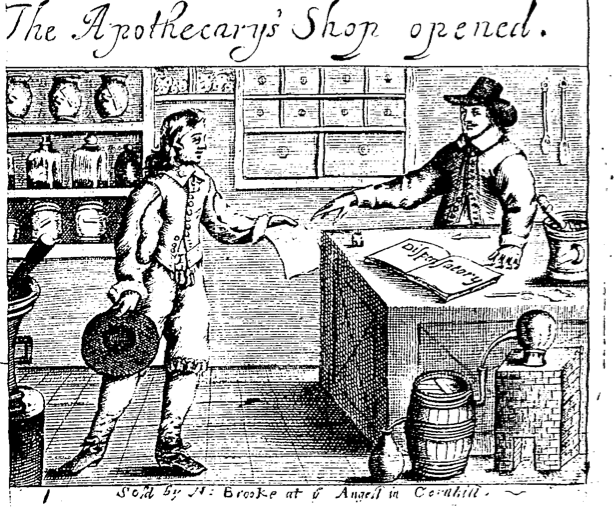 Here is the apothecary opening his shop as it were. 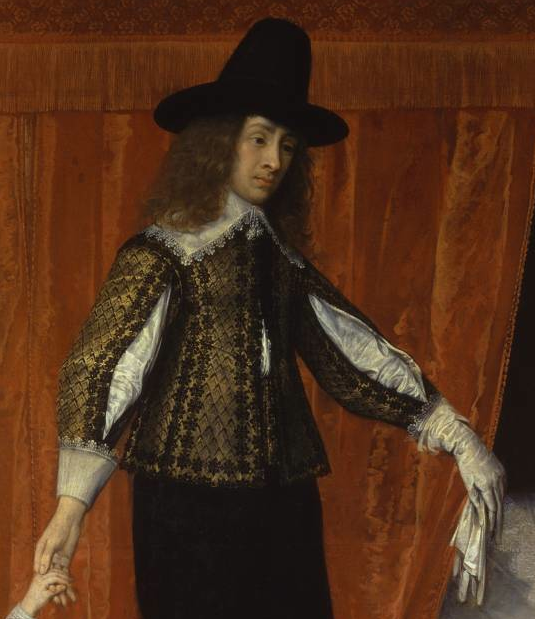 The customer in a typical 1650s short doublet, unbuttoned at the lower end to show off his shirt linen and, of course his codpiece (or fly as we would call it). Open breeches at the leg and some smart shoes. 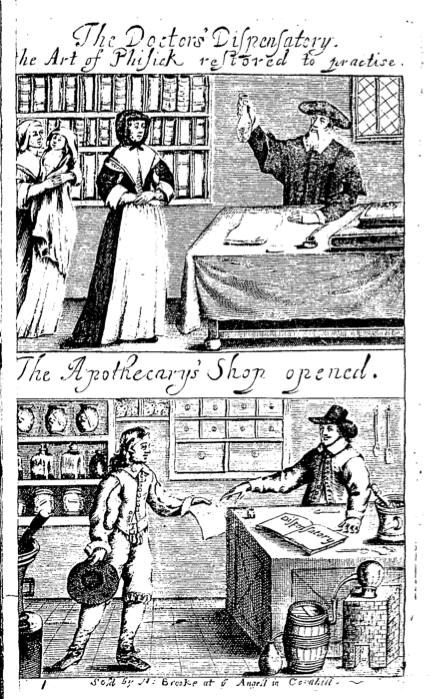 The apothecary looks to be wearing a coat, or maybe a heavier weight doublet and wide brimmed hat. Obviously not a college man. I suspect Old George was father of the George Booth I blogged about previously here, as this portrait (by an unknown artist) also hangs in Dunham Massey, now in the hands of the National Trust. Old George wears some kind of unidentifiable wrap over a linen shirt with an attached collar and decorative tassels on his bandstrings. He also has a black cap with lace edge, which could be part of a liner that could be removed for cleaning. There is an example of one of these in the collection of the Museum of London. Painted in 1649 by James Gandy, this picture hangs in the Royal Albert Memorial Museum in Exeter. As far as I can work out, Deborah, later Dame Deborah was married to Edward Hopton, no relation of the Royalist general Ralph Hopton, but also a King’s man. His brothers however fought for the parliament cause. Definitely by the sword divided! 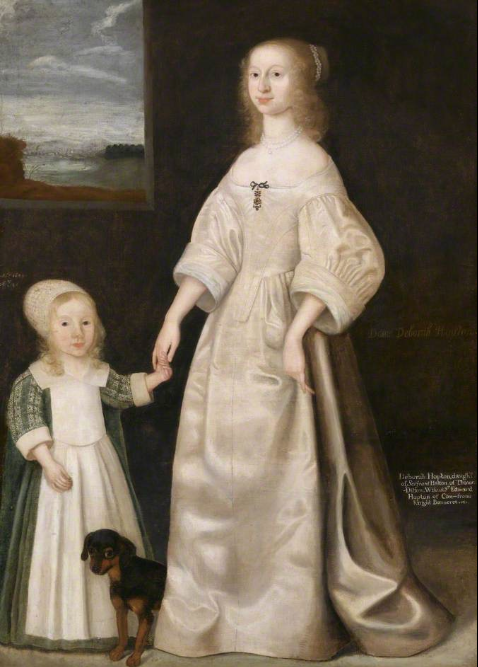 Anyway, here is Deborah and her young son and what looks like a rottweiler puppy peeking out from their skirts. Deborah is wearing a cream satin gown made up of petticoat skirts and a long-tabbed, low-cut bodice with gathered sleeves that reach just below the elbow. Her son is not yet breeched and his petticoat skirts are covered with a practical apron that doesn’t quite reach the floor. He also wears a white work cap and possibly sports the kind of hanging sleeves that could just be used as leading reins. Anyone who has a small child of this size will know how useful they would be! Painted by Richard Hunt in 1642. 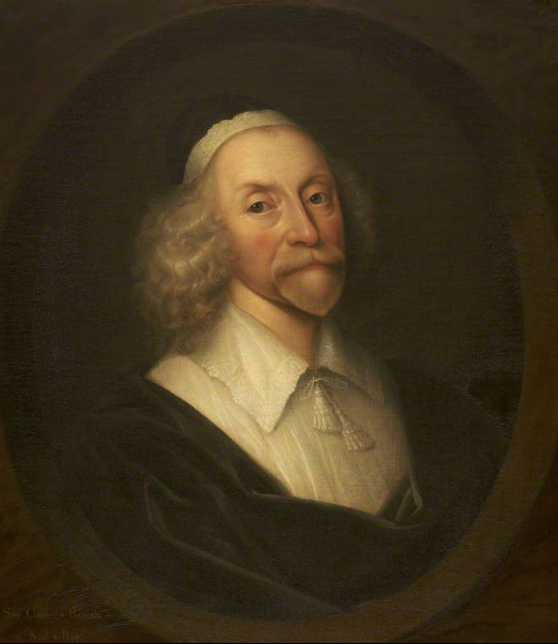 Thomas Singleton was a London skinner who bequeathed some money to Christ’s Hospital foundation and on his death in 1653, this portrait was hung on the walls as part of his will. The portrait shows that some older men at least were still wearing ruffs around their collars in the 1640s. He’s also sporting a nicely embroidered linen whitework cap with lace edging and holding what appear to be a fine pair of gloves with gold thread decoration. The picture is still in the Christ’s Hospital Foundation.